Produced by The Actors' Theatre, Santa Cruz, CA 1990 (of a much earlier version) and by The Metropolitan Playhouse of New York, 1999 (as "History Lessons" also an earlier version). A professor of history and his much younger wife verbally spar, call up memories, and have their lives changed by the amorous young couple at the next table. The play is about getting past first impressions, be they ones formed a week ago or several decades in the past, and how doing so is essential to living a connected life. “Rain and Revolution", written by David Zarko, is an elegant and precise comedy, a script with real dialogue, real concepts and – not least – real people. “Rain" is a warm and funny play, but more than that, it is a compelling and unique look at five interesting people, both individually and collectively. Each of them has a story, but it is the combined effects of plot and dialogue that give the play its substance and results in characters who actually have something interesting to say to each other and to us. For script samples, click here. Jones, an amiable scoundrel, wanders into a stodgy household while running away from the police, only to find himself believed by almost everyone to be their long-awaited relative, an Anglican Bishop from Australia. This play is an adaptation of the farce, What Happened to Jones by George Broadhurst. It follows the story line of the original and uses bits of Broadhurst's dialog throughout. It was developed in rehearsal with the company at The Metropolitan Playhouse of New York in 2000. Produced by The Metropolitan Playhouse, 2000. Go to Directing for photos and reviews. Also by Indiana Area Senior High School, 2013. I recently had the great privilege of directing David Zarko's farce, "The Bishop Comes To Visit", at Indiana Area High School and can proudly claim great success. The audiences thoroughly enjoyed it... As a veteran director for high school theatre, starting in the late sixties, I can honestly say this was one of my happiest experiences. As a teacher of acting... I can unequivocally state that this script offers students countless opportunities... The play is not only brilliantly fast paced and challenging in its verbal and physically demands, but also comfortably within the student range of ability and growth... I believe it is ideally suited for high school production and I most sincerely recommend it. A servant from Bergamo finds himself in Venice serving a woman from Turino who is pretending to be her own brother. A series of even more complicated events makes him also the servant of her lover who doesn't know she is in Venice dressed as her dead brother, whom he killed in Turino. Chaos ensues. A translation from the Venetian and Italian created for a production in California. I stuck very close to Goldoni's dialogue in most cases, while also giving the characters an American tone that places them in social classes recognizable to modern audiences. The many and various loves of a diehard romantic named Anatol, who we follow from his college days to marriage (about fifteen years later), and conversations with his sardonic -- and much more grounded -- best friend, Max. Adapted with reference to seven translations of Schnitzler's play Anatol, it was created because we found none of the translations to be readily playable. The result is a new telling of the story. Produced in a previous draft at Studio III Group, New York, NY, 1990 as "Anatol". It subsequently received staged readings in another much more advanced draft in 2005. This version is a recent re-write. Cast: two principal men, one small male role (Franz), and up to seven women in supporting roles. It can be effectively cast with three men and two women. Set: the play is in seven scenes, but this version allows the various locations to be depicted by a few pieces of furniture that Franz moves while describing the full setting. The Party machine attempts to control an "insurgent" reformer congressman by implicating him in a sexual scandal. This story never goes out of date. An adaptation of the 1911 play by William C. DeMille (Cecil's brother), the flow of dialog, if not the wording, follows the original through much of the first act. The second act increasingly becomes my own, until the story takes a new direction entirely towards the middle of the act. Produced by Metropolitan Playhouse of New York, New York, NY, 2001. Go to Directing for a photo and reviews. In a year when much was mediocre, the following made memorable impressions: The Howard Carter Archeology Award for Unearthing Worthwhile Plays ... and to The Metropolitan Playhouse for their production of "The Woman," an engaging 1911 political drama by William C. de Mille (brother of Cecil B. and father of Agnes). Discovered on microfilm at the New York Library, it was adapted and directed by David Zarko. The two leading female roles speak volumes about emerging feminism. A hardened businessman is visited by spirits one Christmas Eve who take him on a journey of self-discovery. This is a "word-for-word" adaptation of the Dickens classic. The script uses all of the text that Dickens employed for his public readings, plus selected sections from the book that he left out. The narrative sections are performed, from a first person point of view, by the actor to whose character it applies. The staging needs to be fluid, and the text, musical in delivery. Produced by The Northeast Theatre, LaPlume, PA, 2002, and by the same under the name Electric Theatre Company, Scranton, PA 2007, 2008, 2009, and 2010. Also as a benefit for WVIA TV & FM, 2011. Go to Directing for a photo. This is the perfect Christmas event for any theater with a great imagination but a small budget. It can be mounted for practically nothing, and because Dickens' language is allowed to shine, not only is it more powerful than the usual treatment of the text, it is funny, ironic, witty and less sentimental, all without losing any of its appeal. A middle class family is terrorized by a religious zealot who the father of the house has invited to live with them. Based on Moliere's Tartuffe, the story is set in New York City during the LaGuardia administration. My reason; the distance Moliere's audience had from the commedia dell'arte roots he used to build the play, are approximately similar to our distance from the crazy family comedies of the 1930's. Although the script is mostly my own, save for a few minor reshufflings of event, it follows Moliere's story line and reflects his play in how the scenes unfold. Produced as "Mr. Tartoof" in an earlier version at Studio III Group, New York, NY, 1991, and in its current version (though it has since been extensively revised) at Marywood University, September 2011. Go to Directing for a photo. Note: In the 2011 production Mrs. Parnell was played by a man, and Val , Mayor LaGuardia, and Loyal by women. The point being, with this style there is a great deal of flexibility. When Derek asks Alan for spare change one night, it leads to a much more involved conversation than either of them intended -- and a new understanding of "the other side." The Culper Ring was a spy network ordered by General George Washington, one so secret and so tightly organized that some of its members were not identified until the 1930's. Jemmy Rivington was one of those. A mysterious man who seemed to be on both sides at once, he was flamboyant, aggressive, and irrestistably likeable. This short play explores a part of what is known (and speculated) about Jemmy's story. Morris, a professional corporate mascot, has to train Fred, a newbee who has spent his life up until now as an Olympic gymnast and ballet dancer. It's a challenge, but one that Morris feels he can rise to. A wannabe tennis star leaves home forever, makes a promise to a desperate stranger, and opens a tennis school for at-risk children. But it takes a caring jolt to keep him there. An actor discovers that he has hung himself after having had his heart broken once again by his leading lady. He and his artistic director replay the events of the actor's last night, and the dividing line between life and death, real and unreal, grows vague. Produced in an earlier version by The Fabulous Theater Co., San Francisco, CA, 1980-81. Two partners in an ad agency riff on a commercial they have booked for software that mimics handwriting. A short and funny musing on modern absurdities and unexpected consequences. In the mid-seventies, when my award-winning high-school Russian was still accessible -- at least for purposes of reading -- I translated and adapted five short plays by Chekhov. I've spent the ensuing 25 years re-working them as productions revealed their flaws and potential. My Russian has since all but disappeared, and I surmise that the plays have become more playable than they have become more faithful to the original Russian. But I also suspect they are now closer to the original Chekhov in spirit and in how friendly they are to actors and audience. The beginnings of an unlikely romance between a melodramatic widow and a desperate and maniacal creditor. This play is also known as The Bear or The Brute. Produced by Catskill Mountain Theater, Margaretville, NY, 1989, by The Northeast Theatre, LaPlume PA, 2003, and by several community theatres and high schools. Go to Directing for photos. A grandiose bank president, the highly staged-managed 15th year celebration of his tenure, and of how it all goes so terribly wrong. This play is also known as The Jubilee or The Anniversary. Produced in Griffin Conservatory, Scranton, PA 2008. The hapless attempts of a man nervously approaching middle age to propose to his neighbor's daughter. This play is also known as The Marriage Proposal. Produced by Catskill Mountain Theater, Margaretville, NY, 1989, by The Northeast Theatre, LaPlume, PA 2003, and by several community theatres and high schools. An old actor who has just retired finds himself alone late at night in what he believes to be an empty theatre, and muses about his life and work. This play is also known as Swan Song. Produced by The Northeast Theatre, LaPlume, PA 2003, and by several community theatres. A middle-aged man who, on his wife's instructions, is to talk about the bad habit of smoking to a charitable society, instead reveals his life in all its quirky, tedious, and heartrending detail. This play is also known as On The Harmfulness of Tobacco. Produced by Catskill Mountain Theater, Margaretville, NY, 1989, and by several community theatres. When octogenarian Fran fractures her ankle, her friends and her son insist she find home care. Her choice is Felicity, a homeless Puerto Rican woman she takes a fancy to. The reaction is tempestuous, but Fran navigates her way with firm resolve. Unproduced Work-in-Progress. 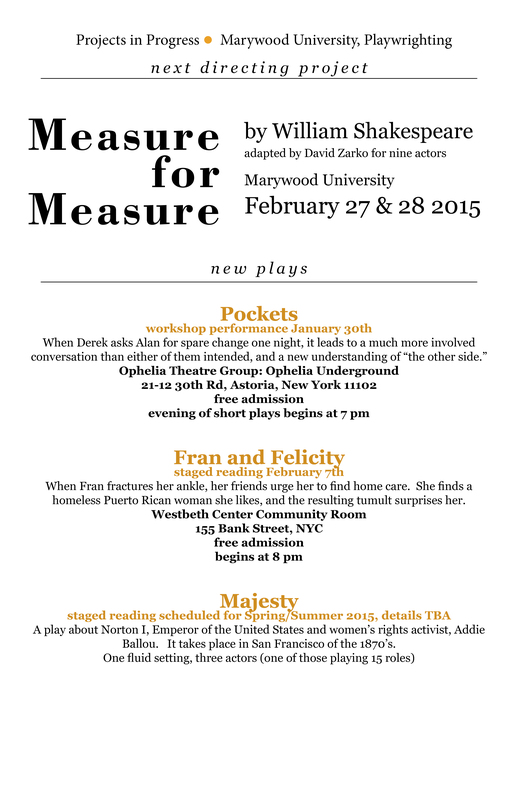 The play has had several table readings and a staged reading in February 2015 at Westbeth Center in NYC. Unproduced. An earlier draft was presented in a staged reading at The Metropolitan Playhouse in September 2013. Another staged reading of the rewritten play will be presented early summer 2015. The play is set on the stoop of a Hell's Kitchen brownstone in Manhattan beginning in 1987. In the first act Dale Grant grapples with having fallen in love with Hector Brown, a complete stranger. His downstairs neighbor, Helen Colfax, counsels him and acts as occasional chaperone. The second act begins in 1990 and follows the next 18 years of what becomes a three-part friendship as they circle, intersect, diverge, follow, flee, and yearn for one another's company. Unproduced. Seeking to ready the script for a table reading. It's Christmas. Maureen's father is unable to communicate due to a stroke, her ex-husband wants to use their kids in his campaign for mayor, she's about to get laid off and decides the cure to all of this is a real tree and dinner at table. But when son Conor discovers that his dad wants to destroy their city's downtown, piece by piece, he takes on a cause that sends Maureen's notions of family into uncharted territory. In 1980 a young man spent several months in an ashram in India. When his stay was finished, he proceeded to tour Southeast Asia's gay culture with an enthusiasm equal to that he had given to exploring the inner world of meditation. He falls in love, others fall in love with him, he is cast in a movie, and sings Cole Porter. Based on the diary of a late friend. Cast: eight principal males, eight minor male roles, one woman, one girl. Doubling possible. All but three roles are Asian. Set: formal set with no determined location. Note: LGBT themes, Cole Porter songs, Balinese dancing and music. Jeff's nickname is "hippie" according to his boss at the auto parts store he clerks at in the tiny town of Black Bear nestled in the Pocono Mountains. Jeff protested during the war in Viet Nam, and keeps a low profile locally where he also serves as a volunteer on the EMT. But Jeff has a secret, and when his daughter is accepted to the Sorbonne, the financial challenge that results brings his secret -- and Jeff's own insecurities -- into the open. Based on the novella of the same title by Daniel Grotta. Unproduced Work-in-Progress; it has had a table reading and is now being rewritten. Cast: six men, three women, one boy. Set: formal with three locations indicated. From an original scenario of the commedia dell'arte, true love is thwarted by misguided old fools, but a clever and romantically inclined servant helps love win in the end. The play alternates between scripted dialogue and detailed scenario upon which the actors improvise. A farce with some singing. Produced by The Post Theatre Company, Brookville, NY 1993, at American College Theatre Festival Region II, 1994 and at Hudson Guild Theater, New York, NY, 1994. This script (with rehearsal and teaching instructions) is being revisited. Inspector Walter Conrad serves on Campus Security of a quiet university. His life is, in fact, quieter than he would like, his marriage is deteriorating, and his health is on the edge. Then one morning the body of a young woman is discovered in the chapel, and he is propelled into a bizarre and layered world of power, money, and academic politics.